Break meat into large pieces in 12-inch skillet. Cook over medium-high heat 5 minutes, stirring occasionally. Stir in onion and celery. Cook about 5 minutes longer or until meat is brown; drain. Stir in remaining ingredients except vegetables. Spoon into slow cooker. Cover and cook on low heat setting 8 to 9 hours. Stir in vegetables. Cover and cook on low heat setting about 15 minutes longer or until vegetables are tender. Serve with noodles. 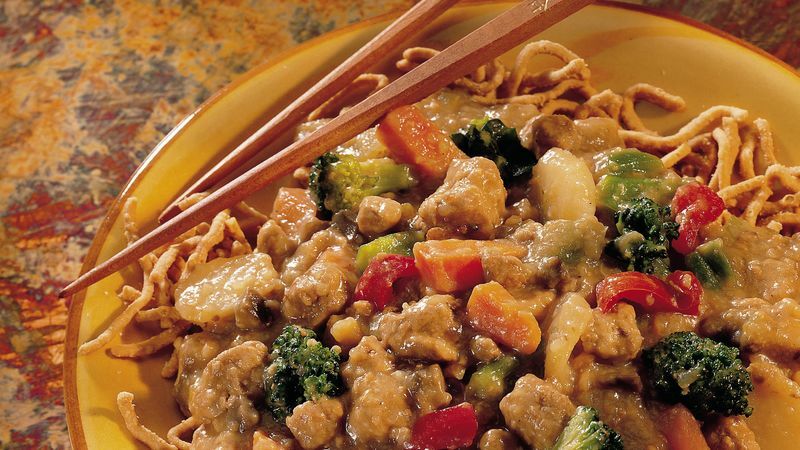 Chow mein meat is usually coarsely ground pork. If it isn't available, use regular ground beef or pork. For safety, start with hot cooked ground meat when slow cooking. Cold uncooked ground meat takes too long to come to a safe temperature in a slow cooker. Also, use cooked and drained ground meat to help eliminate the extra fat and liquid that accumulate during cooking.